It looks like Robert Oster ink is going to become a habit for me. I reviewed Tranquility yesterday, and I'm covering Aqua today. I'm completely in love with both. I bought my bottle of Aqua at Goulet Pens. The bottle is very efficient, tall skinny bottles make it easy to fill pens. I like the Gold label-it's very classy. I love that there is a label on the top-with the color name and a tiny little swab. With some brands I have a really hard time finding the right bottle when they are in a drawer and all look the same from the top. Aqua is a beautiful blue, with a pink sheen. Seasonally, I would use this ink in the winter. I don't know how anyone can resist an ink that sheens like this one does. I'll admit, the sheen doesn't come out a ton in everyday writing, but in ink drops the sheen is gorgeous. 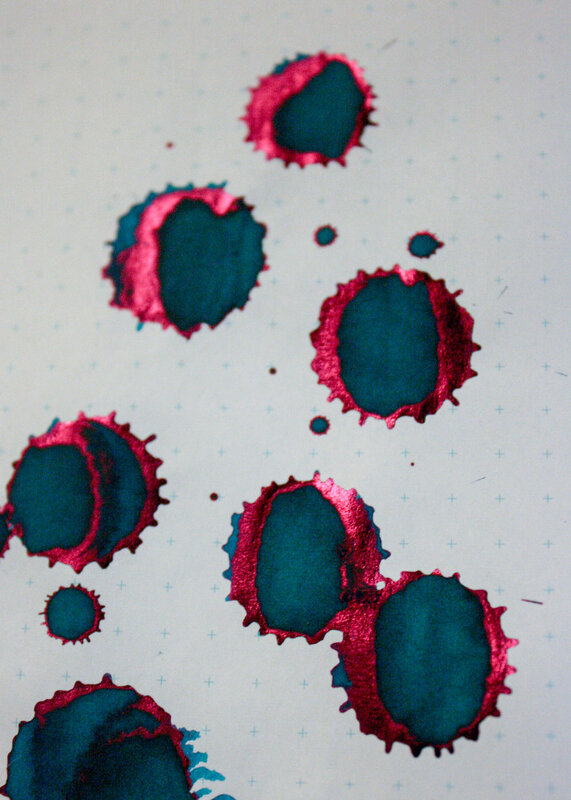 Aqua is actually very similar to J. Herbin Emerald of Chivor, just without the sparkles. Tranquility is more green and Aqua is more blue, but I love both. Both have a pink sheen and amazing shading. I obviously need more Robert Oster Ink in my life. Overall, this ink had high shading and at least a little sheen on every paper. This is the second Robert Oster I've fallen in love with. I can't wait to try more of them.